Peppermint bark has always been an illusive treat I have been wanting to try for what seems forever, not realising it's actually incredibly easy to make yourself! 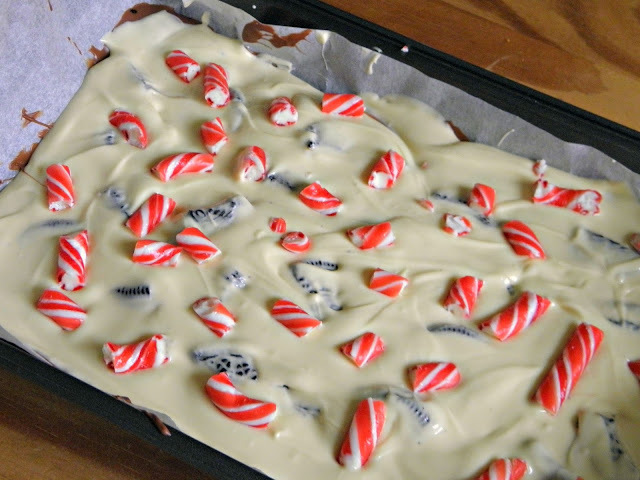 After trying a few recipes and tweaking the ones I liked, I came up with this easy one for Peppermint Cookie Bark. If I do say so myself, it tastes absolutely delicious! 1. Break up all the dark chocolate. I'm silly and accidentally bought milk chocolate which isn't as good as dark chocolate, but will still work. Pop it into a glass bowl and melt the chocolate. I prefer doing this in a bowl over a pan of water but you can do it in the microwave for 30 second intervals too. 2. Break up the cookies into chunky pieces - about quarter sizes. For this amount of bark, I found three oreos were sufficient. Line a deep baking tray with some grease proof paper. 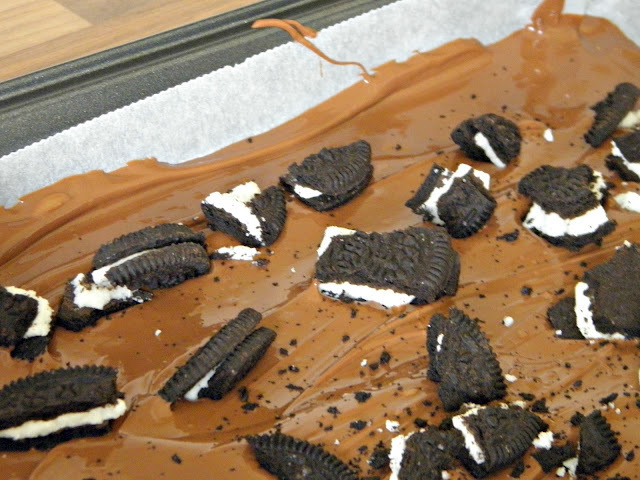 Add the broken cookie pieces into the melted chocolate. Pour the melted chocolate in, covering the bottom of the tray, and pop it in the fridge to set. It should take about 2 hours but the longer the better. 3. Next you need to make some peppermint chips! 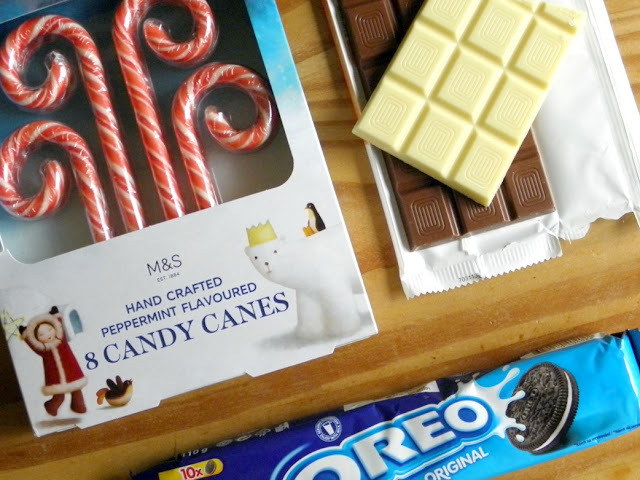 Get the candy canes and break into small pieces. I made my pieces all different sizes, just so it looked textured when it was added to the bark. The candy canes were easy to break, I just used my hands, but you may need to use a knife to break the pieces up (just be extra careful if you do use anything sharp!). 4. Break up the White chocolate and melt in a glass bowl. White chocolate melts much faster so be careful not to burn it. Take the tray of dark chocolate out of the fridge and let it get to room temperature. It only needs a couple of minutes to do this, it just makes it easier to pour the melted white chocolate on top. Pour the White chocolate in the tray, covering all the dark chocolate and cookies, then sprinkle the candy cane pieces into the White chocolate. 5. Wait for everything to set. Ideally, leave it a couple of hours or cover it up and leave overnight. Once the chocolate is set, you can remove it from the tray. 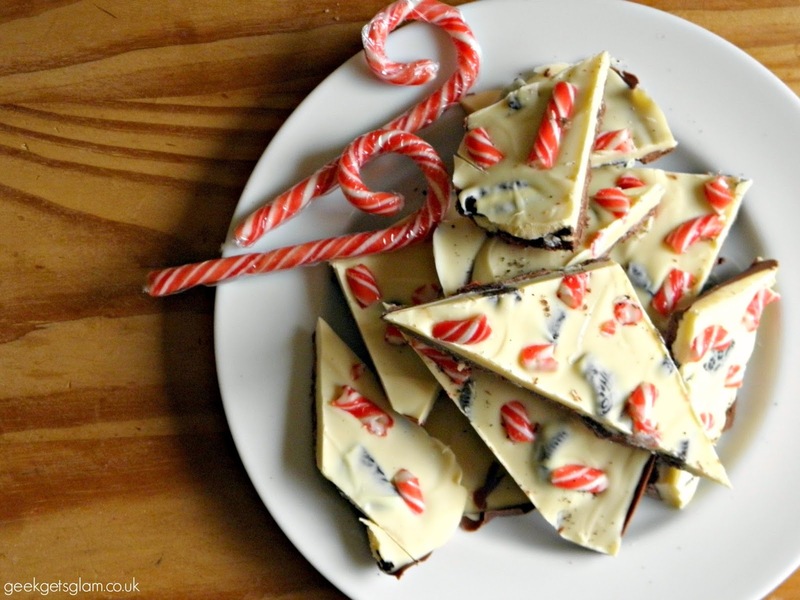 Break the chocolate into pieces - it doesn't have to be neat as candy bark looks more like shards than squares! 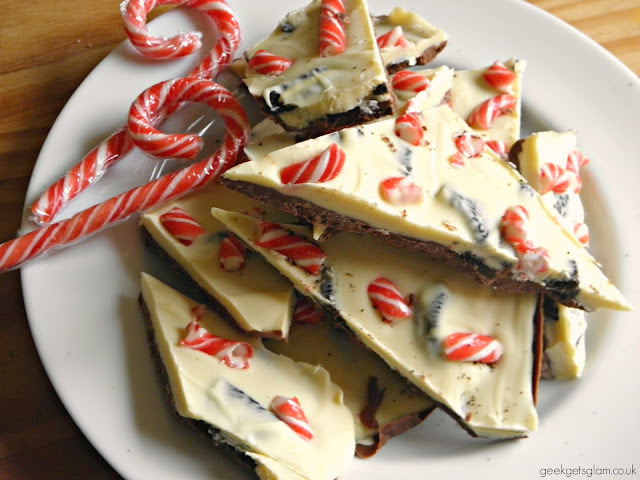 I love how easy it is to make peppermint bark. It makes a fantastic Christmas gift or treat at Winter time plus it looks spectacular! The cookies give it an extra crunch too. Will you be trying peppermint bark this season?